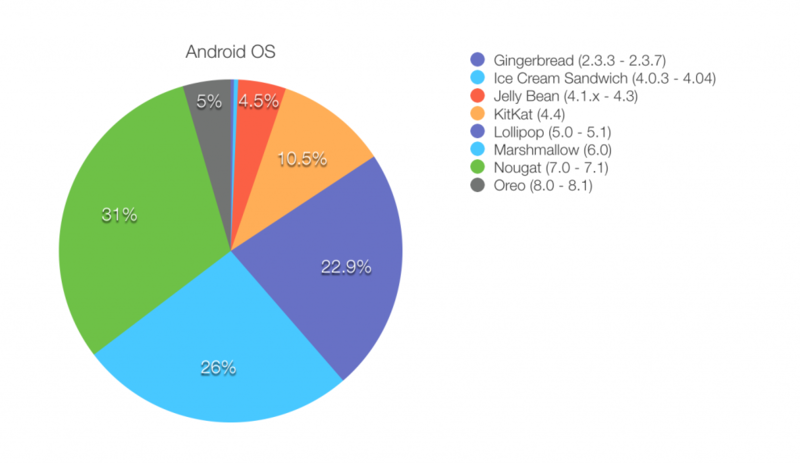 In a January post, we noted that only 1.1% of Android users had upgraded their phones to Oreo, Android’s latest operating system. Since then, we’ve seen a slight boost to 4.6%. Nougat is also seeing a slight rise in users, from 28.5% to to 30.8%. However, that small increase allowed Nougat to finally bypass Marshmallow’s current 26% of users. For a very long time Marshmallow remained the number one used OS, but now Nougat can claim that title. We can also compare this information to April 2017’s data, which we discussed in a blog post. You can see the fall in usage of each OS up through Marshmallow, before seeing the jump for Nougat. A total of 7.1% were using Nougat at this time last year, compared to this year’s 30.8%. Oreo 8.0 was released in August 2017, and only to a few select phones. If you had Nexus 5X, Nexus 6P, a Pixel or Pixel XL (all Google phones), you were one of the lucky few with the earliest access to the update. These phones have also received the 8.1 update. Since then, a few new phones have shipped with Oreo, including the Pixel 2, Pixel 2 XL, and Galaxy S9 and S9+. That is the main reason that Oreo usage is so low – most people simply don’t have it as an option. Phone companies have since been delivering 8.0 and 8.1 to their devices, slowly but surely. Digital Trends contacted phone manufacturers to find out just when they plan on releasing Oreo to their phones. 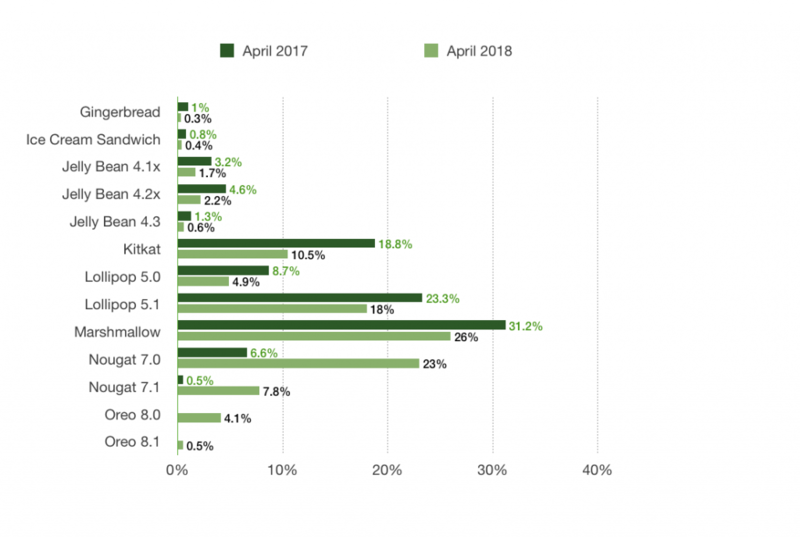 Many of them have already released 8.0 on a handful of their devices, 8.1 to others, and have plans to roll out to more of them later this year. Among these companies are Samsung, Asus, Nokia, Huawei, Motorola, OnePlus, HTC, and Sony Xperia. 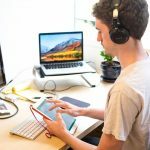 It’s typically a long and costly endeavor for manufacturers to update their devices to the latest Android operating system. However, the Android team stated in May 2017 that it would be easier for phones to update to 8.0 than past versions, because of new modular architecture called “Project Treble”. So far the process doesn’t seem to be moving very fast, but we will give it more time. It will be interesting to see how quickly the usage rises as Oreo is rolled out over the next few months. Meanwhile, the Android Developers Blog announced the next operating system, ‘Android P’, releasing a developers preview in March. They state that more information will be given in May, at Google I/O. Things to look out for include indoor positioning, display cutout support, improved messaging notifications, and multi-camera API. The most recent Samsung release was the Galaxy S9 and S9+ – released in March of this year. It has had very positive reviews, mostly stating that it’s a perfect step up from the also-revered Galaxy S8. A Galaxy Note 9 is slated for July. We’re also excited about seeing the Google Pixel 3 in October, which will likely come with Android N.
Tracking customers’ usage on Android devices helps you to make the right decision when it comes to picking which devices to test on. What this month’s data tells us is that even though not many are using Oreo at the moment, that number is going to keep rising, and we want our clients to be prepared for the time when other phones receive the update. And for those who have Oreo currently, they definitely expect their apps to work on their new phones. 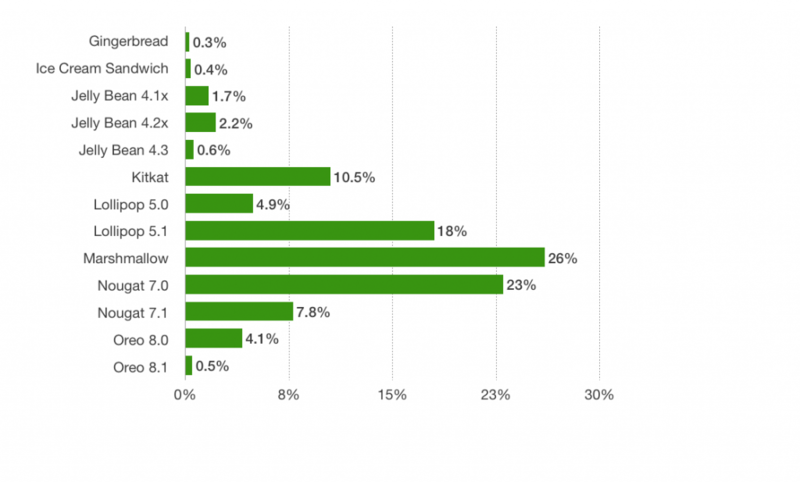 Additionally, Nougat and Marshmallow continue to make up the largest pieces of the market. In our lab, we have multiple devices with each OS for testing. Reach out to us if you’d like to talk about making sure your app works for everyone.